On May 13, 1917, the children purportedly saw a lady “brighter than the sun, shedding rays of light clearer and stronger than a crystal goblet filled with the most sparkling water and pierced by the burning rays of the sun”. The woman wore a white mantle edged with gold and held a rosary in her hand. She asked them to devote themselves to the Holy Trinity and to pray “the Rosary every day, to bring peace to the world and an end to the war”. While they had never spoken to anyone about the angel, Jacinta divulged her sightings to her family despite Lucia’s admonition to keep this experience private. Her disbelieving mother told neighbors as a joke, and within a day the whole village knew. The children said that they had been bidden to return to the Cova da Iria on the thirteenth of the following month. Lucia’s mother sought counsel from the parish priest, Father Ferriera, who suggested she allow them to go and bring Lucia to him afterward that he might question her. The second appearance occurred on June 13, the feast of St. Anthony, patron of the local parish church. On this occasion the lady revealed that Francisco and Jacinta would be taken to Heaven soon but Lucia would live longer in order to spread her message and devotion to the Immaculate Heart. As the account of this meeting was written after the deaths of Francisco and Jacinta, it may be an instance of retrospective prophecy. Thousands of people flocked to Fátima and Aljustrel in the following months, drawn by reports of visions and miracles. On August 13, 1917, the provincial administrator Artur Santos (no relation to Lúcia Santos), believing that the events were politically disruptive, intercepted and jailed the children before they could reach the Cova da Iria. The administrator interrogated and threatened the children to get them to divulge the contents of the secrets. Maria’s mother hoped the officials could persuade the children to end the affair and admit that they had lied. Lúcia told him everything short of the secrets, and offered to ask the Lady for permission to tell the Administrator the secrets. That month, instead of the usual apparition in the Cova da Iria on the 13th, the children reported that they saw the Virgin Mary on 15 August, the Feast of the Assumption, at nearby Valinhos. 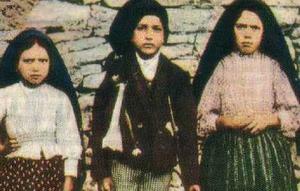 The three children claimed to have experienced in total six apparitions of the Blessed Virgin Mary between May 13 and October 13, 1917. John Paul II credited Our Lady of Fátima with saving his life following an assassination attempt on the Feast of Our Lady of Fátima, 1981. He donated the bullet that wounded him to the Roman Catholic sanctuary at Fátima, Portugal and it was placed in the crown of the Virgin’s statue.